Although this week has been a lot more active than the last, it started off very calmly on Monday. Everyone was in a very relaxed mood. 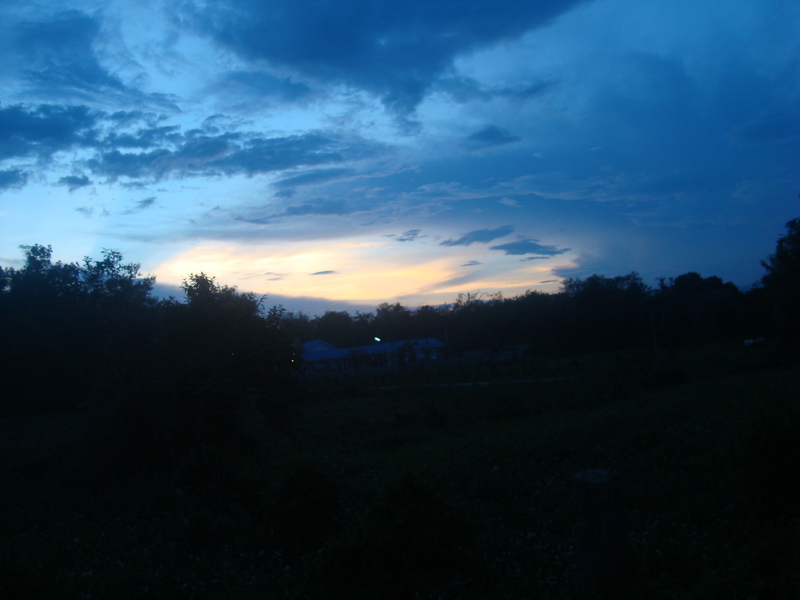 By the evening, we had prepared a bonfire to get rid of all the fallen branches and bamboo from the storms. 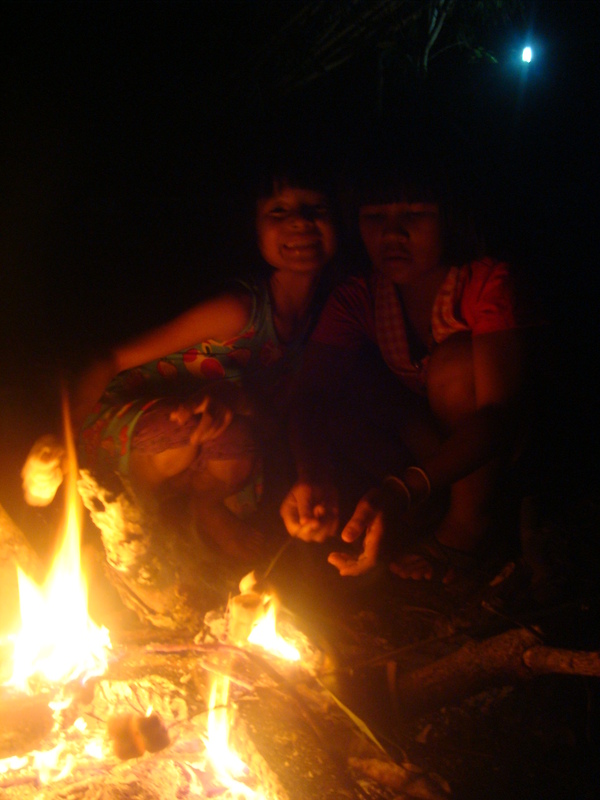 When the fire got going we sat around roasting marshmallows; a very farang activity I had thought, but no, Darid was the pro! On Tuesday, we finally managed to get everyone out of the centre! We all went to a beautiful waterfall. 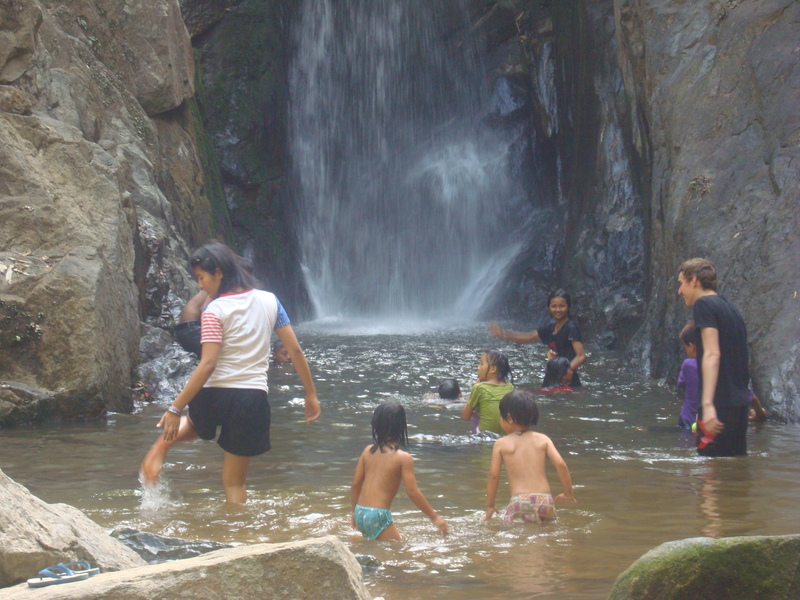 There were smaller collections of pools around the waterfall where the kids could splash around in too. 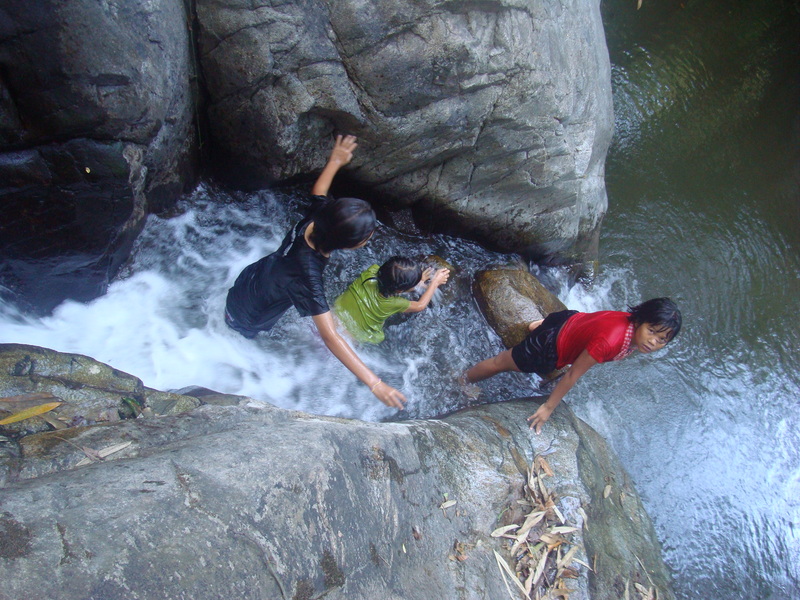 However, knowing how adventurous the kids are, it didn’t surprise me at all that even the youngest ones (who are still beginners in swimming) jumped into the deepest parts around the waterfall. Darid even climb up and through part of the waterfall, with Jirapon, Nupon and I following. We went for a walk too, following the waterfall up hill where other smaller waterfalls were to be found. Before setting off back home, some of the kids went off to collect some leaves, that were naturally growing there, to cook with later. It had been a perfect day out and we all had loads of fun. It appears that little Titi has really gotten into photography. During the evenings she politely asks to borrow my camera and takes very good care of it. Half an hour later, she always returns with amazing pictures! It looks like we have come across another talent of hers! It was the kids first day back at school on Thursday and Titi’s first day of Thai school. We picked up the little ones at four and I walked with them back home. As soon as we got back, Titi changed right away and started hand-washing her uniform all by herself! It was so sweet how excited she was about school. She seems to really be loving it. The next day, I walked the kids home again. This time, we all bought delicious ice-cream from the school grounds. On the way home, we passed a neighbour who had a lychee tree growing in her garden. The children got busy chatting away with her in Thai and on Saturday I found out that our neighbour had prepared handfuls of lychees and flowers for the children. Little Waneetda also returned to the centre on Saturday. She will be starting school for the first time this Monday! Sunday arrived and I realised it was my last whole free day with the kids here. So, I decided I’d take them out to ‘The Beach’ again, their absolute favourite place. Until it began to rain. So I tried to think of another activity – Kate and I sat down making masks, hoping that the other kids would sit down and join in! Kate and I were loving it! I don’t know if I’ve ever been so enthusiastic with arts and crafts. It didn’t take too long until Little Waneetda sat down to join in. However, decorating her mask didn’t enthuse her as much as trying to glue it to her face. Every time she did this she would giggle and giggle and giggle and then we would all start giggling. I wanted to treat the kids to a nice big meal as there probably wouldn’t be more time during the week with school. It didn’t quite work out as I had hoped for….. I promised the children I’d buy them all big chicken pieces and we would make a feast! I had only told Darid, the oldest boy so far, but within minutes the word had spread like wild fire among the younger children at the centre – A mob of hungry, chicken-lovers had gathered outside my room chanting ‘EMMA – CHICKEN – EMMA -CHICKEN’ I walked out to find all of them hanging out there, an unusual place for them. So Kate and I set off on the scooter. As it was a Sunday, places packed up most of their food quite early. 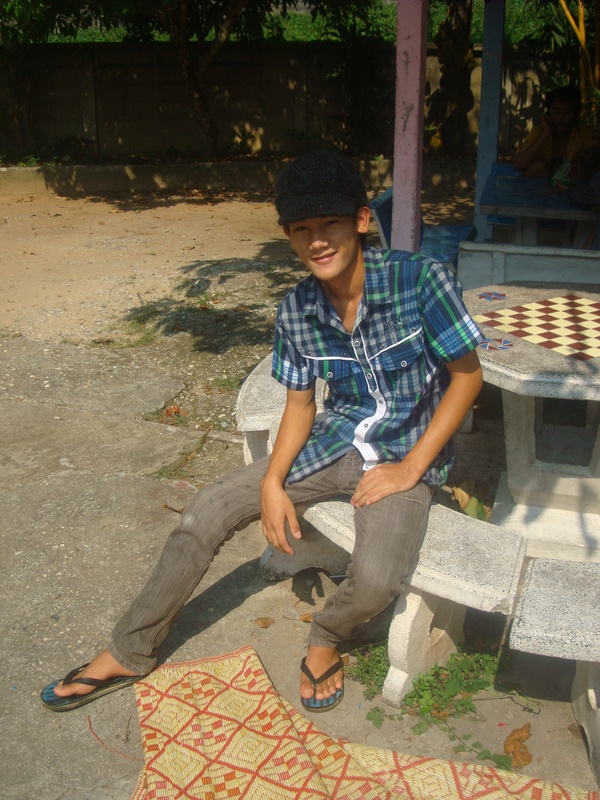 We really did drive around for about an hour looking for some chicken or even duck or even Moo-Ping (pork on stick) …. but everyone just sent me on my way. I returned to hungry, disappointed faces at the centre. They had been so excited for the big feast that they were all sitting in a big group waiting! Yep…they hit my soft spot.. so out we set again to Barry’s American restaurant close by and I bought them all pizza! It wasn’t chicken, but hey, they were loving the pizza. After the food settled down in our stomachs a dance battled started to kick off! Jira put on her beat-boy music and hit the dance floor, whilst Nupon filmed it all. The little ones jumped in and out of the dance ring showing off their moves. I tried doing the ‘worm’ for them (which included falling gently onto the floor from standing height), but I’m afraid it’s been a while and SPLAT was how I landed, flat on the floor with kids starring at me and music seeming to fade into the distance. Frightfully embarrassing, but at least they all had a good laugh and I went on as if my SPLAT was on purpose! Darid looking very stylish for our waterfall-day-out! Next: Next post: A busy week!